The only time you should ignore a bully is if they are an internet troll. When a bully is all up in your face, ignoring them is stupendously bad advice. You need to stand up to bullies when they confront you in person. When they send something electronically, you can ignore them and pretend you didn’t see it. It’s almost always a bad idea to defend yourself online. But in person, oh heck yeah – you need to say something. The problem is how. 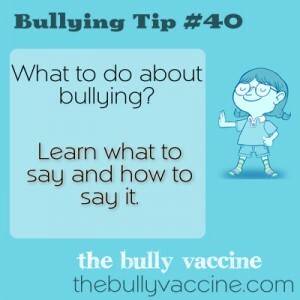 The best thing to do when being verbally assaulted by a bully is to respond verbally. How you do that is more important than the specific words you use. Your goal is to show the bully a) you aren’t afraid of them, b) that what they did was stupid and rude, and c) if they continue, you have every intention of reporting them. Ideally, you should exude an air of pity that this person is incapable of behaving in a civilized fashion. This is all easier said than done. Especially for people who may have anxiety disorders or sensory issues or other neurological problems that make communication with other humans difficult. Don’t assume you can just off the cuff say what you need to say in the way you need to say it. You need to practice saying whatever it is you plan to say so that when you are confronted by a bully, the words will come to you. Practice is a wonderful thing. It makes behaviors automatic under stress. If you don’t practice, you will most likely be tongue tied. Here are the three things you need to do: You need to be calm, you need to make eye contact if possible (if not, look at one of their ears or the top of their head), and you need to repeat your go to phrase until they leave you. Don’t get creative, just repeat yourself. Seriously – repeat yourself. So, what can you say? That depends on what has been said to you. “Thank you very much for that information. It’s very helpful.” Or “Don’t be so juvenile,” Or “whatever.” Again, what you say is less important than how you say it. So decide on something you can say and practice saying it in a bored tone of voice and practice making eye contact or looking where-ever you feel most comfortable looking as long as it isn’t down. If you are being threatened say, “If you do that I will report you.” And if they do, report them. Every single time. If they are attacking you, get away and report them.